Color blindness has been around for as long as anyone can remember, but for the first time, one can see the vibrancy of color! Enchroma created glasses that can separate wavelengths of light like a filter. Normally, everyone has 2 receptors, red and green, that can filter light normally, but when there's an abnormality, these receptors can misunderstand the wavelengths and mess up the colors. With Enchroma's glasses filtering out specific wavelengths of light, your brain will figure out the color and begin to display the right definition of color! According to genetic population statistics it is estimated that 4 out of 5 cases are forms of partial color blindness (also called anomalous trichromacy) which are addressable using the EnChroma optical lens technology. 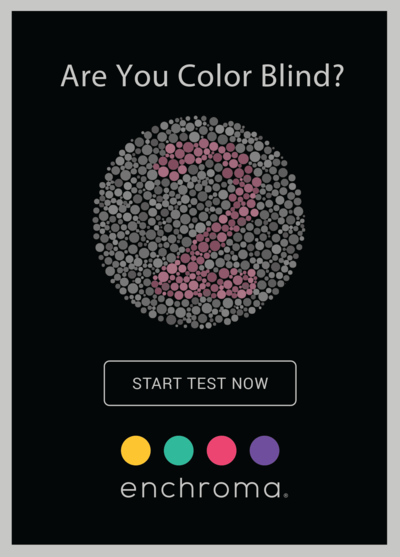 Color blindness (also called color vision deficiency by vision scientists), is a condition in which the retinal cone cells respond to light differently than normal. People with color blindness can usually still see colors but have color confusions or see certain pairs of colors so similarly that they cannot tell them apart. Next, check out some designer frames in Moorestown New Jersey we carry at our optical. Call us now to schedule a consultation!